December 1, 2017 — DECEMBER IS A TIME TO CELEBRATE FAMILY AND THE HOLIDAYS! While it’s still pretty fair weather for December, don’t forget that there are plenty of festive, Seasonal Events happening at your favourite Bingos in and around the GTA. The Christmas Weekend is very long this year, with Christmas on a Monday and Boxing Day on the Tuesday. Check out your favourite Hall’s advertisement for more details, including “12 Days Of Christmas” activities. Plus, you’re sure to have a great time and lots of fun at BINGO NEW YEAR’S EVE EVENTS, planned at all of our advertising Bingo and Gaming locations. DELTA BINGO AND GAMING has been celebrating their 50th Anniversary as a company and, as they prepare for their big, $500,000 Mega Bingo (December 31st, starting at noon at the Delta Bingo & Gaming St. Clair location), we wanted to say THANK YOU for the support over the years — and to wish them all many more years of success! We are, and always have been, proud to represent your Gaming Centres, your great staff and your excellent charities. Mississauga’s Delta Bingo is pleased to offer their annual “12 DAYS OF CHRISTMAS” promotion this December, with great cash prizes to win, including chances to win a “Golden Ticket”. Also, additional “GOLDEN TICKET” draws will on the first two Saturdays of the month. These Golden Tickets get you into Delta’s $500,000 Mega Bingo (to be held on December 31st, 2017, at Delta Bingo & Gaming St. Clair). Full details in the Hall. They will also continue their popular “DOLLAR DAY” Special on every Wednesday Session! CLICK HERE FOR MORE! Delta Bingo Downsview continues their popular “FREE BINGO GAME“, which plays at every Saturday 7pm Session. Plus, they will be giving away “DELTA MEGA BINGO” entry tickets at draws to be held Sunday, December 17th, at all five Session. These Golden Tickets get you into Delta’s $500,000 Mega Bingo (to be held on December 31st, 2017, at Delta Bingo & Gaming St. Clair). CLICK HERE FOR MORE! Burlington’s Bingo Connection will celebrate the Holidays with their popular “12 Days Of Christmas” activities from December 13th through December 24th. Plus, there’s a fantastic “$10,000 U-PIK-‘EM” opportunity and a “$7,000 CATCH THE STAR” opportunity to win even bigger. Check out some of the other Letter S chances available on their unique page on our website. CLICK HERE FOR MORE! Ultimate Bingo continues to offer their very popular, huge $20,000 and $10,000 BONUS EVENTS! CLICK HERE FOR MORE! Check your favourite Gaming Centre location’s advertisement by using the pull-down menu along the top of our website. November 1, 2017 — NOVEMBER IS A TIME TO REMEMBER! A few big things to remember this November include our clocks going back one hour on Sunday, November 5th, as well as Remembrance Day on November 11th. It’s also time for our 15th Anniversary issue. We are grateful to our advertisers and to our readers for helping us reach this milestone. Check out this special page we created for our November issue. Mississauga’s Delta Bingo is holding their “ALL WINNERS PROMOTION” through the month, with special Games to be held Thursday, November 30th. Also “GOLDEN TICKET” draws will be held at SATURDAY SESSIONS every week through November. These Golden Tickets get you into Delta’s $500,000 Mega Bingo (to be held on December 31st, 2017, at Delta Bingo & Gaming St. Clair). Full details in the Hall. They will also continue their popular “DOLLAR DAY” Special on every Wednesday Session! CLICK HERE FOR MORE! Delta Bingo Downsview continues their popular “FREE BINGO GAME“, which plays at every Saturday 7pm Session. Downsview will also be offering “DELTA MANIAC MONEY BALLS” and new “DOUBLE ACTION VALUE PRICING“. Plus, they will be giving away “DELTA MEGA BINGO” entry tickets at draws to be held at every Monday, Friday and Saturday 7pm Session. These Golden Tickets get you into Delta’s $500,000 Mega Bingo (to be held on December 31st, 2017, at Delta Bingo & Gaming St. Clair). CLICK HERE FOR MORE! Burlington’s Bingo Connection Players love the new “LETTER S” available on the Players Progressive. Plus, there’s a fantastic “$10,000 U-PIK-‘EM” opportunity and a “$7,000 CATCH THE STAR” opportunity to win bigger. Check out some of the other Letter S chances available on their unique page on our website. CLICK HERE FOR MORE! October 1, 2017 — OCTOBER MEANS IT’S TIME TO WARM UP TO BINGO EXCITEMENT! October is also the month for THANKSGIVING. When it comes to Bingo, one of Ontario’s most important forms of fundraising for Charities and Not-For-Profit groups — and the hundreds of Bingo Sponsors are always thankful when you give through Bingo and Gaming. Remember, Monday, October 9th is Thanksgiving. Bring your family and friends to a local Bingo and Gaming Centre and we know you’ll have a fantastic time — plus, there are Specials (listed below). Also, Tuesday, October 31st is Hallowe’en. We’re sure you’ll have a boo-tiful time playing your favourite Bingo Games and enjoying seasonal Specials (listed below). Mississauga’s Delta Bingo is welcoming “COUNT CA$H” all day on Hallowe’en and he will have some extra Specials throughout the whole day. Also “GOLDEN TICKET” draws will be held at THREE SESSIONS every week through October. These Golden Tickets get you into Delta’s $500,000 Mega Bingo (to be held on December 31st, 2017, at Delta Bingo & Gaming St. Clair. Full details in the Hall. They will also continue their popular “DOLLAR DAY” Special on every Wednesday Session and their special Friday & Saturday 7pm event, where you can win up to $27,000. Finally, don’t forget Mississauga offers an amazing Player’s Progressive Prize — up to $45,000!!! CLICK HERE FOR MORE! Delta Bingo Downsview continues their popular “$20,000 FREE GAME“, which plays at every Saturday 7pm Session. Plus, they will be giving away free, seasonal Dabbers on Thanksgiving and on Hallowe’en. Delta Downsview will also be introducing their new, “DELTA MANIAC BALLS” in October. See Hall for official launch date. Finally, remember to sign yourself up for their “INNER CIRCLE” V.I.P. Club. Gather points and feel the love. CLICK HERE FOR MORE! September 1, 2017 — SEPTEMBER IS ABOUT GETTING BACK TO REGULAR SCHEDULES, BACK TO SCHOOL AND BACK TO BINGO! With early fall starting to set in, and Labour Day just on the horizon, we welcome everyone back to normal schedules and back to Bingo. Remember, Monday, September 4th is Labour Day. Do you know what that means? Special opportunities at your favourite, local Bingo and Gaming Centres. Check individual Gaming Centre advertisements for more details. Ultimate Bingo offers some of the biggest Jackpot opportunities in the whole GTA and will continue to offer their very popular, huge $20,000 and $10,000 BONUS EVENTS! CLICK HERE FOR MORE! Mississauga’s Delta Bingo is running their famous, “$34,000 TOURNAMENT OF CHAMPIONS PROMOTION” in September, with the Final Event to be played on Friday, September 29th! They will also continue their popular “DOLLAR DAY” Special on every Wednesday Session and their special Friday & Saturday 7pm event, where you can win up to $27,000. CLICK HERE FOR MORE! Delta Bingo Downsview continues their popular “$25,000 FREE GAME“, which plays at every Saturday 7pm Session. Remember to sign yourself up for their “INNER CIRCLE” V.I.P. Club. Gather points and feel the love. CLICK HERE FOR MORE! Burlington’s Bingo Connection Players love the new “LETTER S” available on the Players Progressive. Plus, there’s a “$10,000 U-Pik-‘Em” opportunity. Check out some of the other Letter S chances available. . CLICK HERE FOR MORE! August 1, 2017 — AUGUST IS ABOUT RELAXING AND HAVING FUN! The summer is flying by fast, but we hope you’ll still be finding time to play your favourite Games at your favourite Bingo Hall or Gaming Centre. You should also keep in mind that Monday, August 7th is a Civic Holiday. While it might not be a statutory holiday for everyone, we do hope that, if you have a day off, you’ll stop by and play a Session or two of Bingo. Finally, we are very excited that so many people are stopping by our new YouTube Channel and checking out our new videos. We are hoping to be adding more Social Media presence in the coming weeks. We are also working on a big idea to help you get Jackpot information for our advertisers even faster — but, more on that later. Ultimate Bingo offers some of the biggest Jackpot opportunities in the whole GTA and will continue to offer their very popular, huge $20,000 and $10,000 BONUS EVENTS! You can also check out pictures and video from their Canadian History-making “$250,001 Monster Bingo”. For a single Hall, this record will likely stand for some time. CLICK HERE FOR MORE! Mississauga’s Delta Bingo is running their famous, “ALL WINNERS PROMOTION” in August, with final special Games to be played on Tuesday, August 29th @ 7pm! They will also continue their popular “DOLLAR DAY” Special on every Wednesday Session and offer their special Friday & Saturday 7pm event, where you can win up to $27,000. Finally, don’t miss the “DELTA MONEY TRAIN” dates, where you can win $10,000. CLICK HERE FOR MORE! Delta Bingo Downsview just celebrated their 18th Anniversary and you can see pictures on their page. Downsview will continue their popular “$25,000 FREE GAME“, which plays at every Saturday 7pm Session. Also, don’t miss the “DELTA MONEY TRAIN” dates, where you can win $10,000. Remember to sign yourself up for their “INNER CIRCLE” V.I.P. Club. Gather points and feel the love. CLICK HERE FOR MORE! July 24, 2017 — OVER 250 VIEWS ON OUR YouTube CHANNEL IN JUST FIVE DAYS — EXCITING!! Bingo Player Magazine is very happy to see that so many people in such a short time are finding and watching our recently uploaded videos on YouTube. 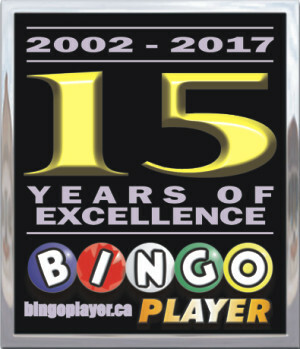 Thank you to deltabingo.com and to ultimatebingo.ca for posting and linking with their own social media platforms. We are thrilled with the amazing feedback. We really do love what we do — and now there’s even more we can do to help promote Bingo and Charitable Gaming Centres in Ontario. July 18, 2017 — BINGO PLAYER JOINS THE YouTube GENERATION! Bingo Player Magazine is proud to announce that we are now on YouTube. Just search “Bingo Player Magazine”, or click the YouTube logo below to check it out now. We had two great opportunities in July to not only attend fantastic Bingo events, but to take pictures and video of some of the major highlights. Of course, Ultimate Bingo hosted their Canadian Bingo History-making “$250,001” Monster Bingo. We also attended afternoon Sessions at Delta Downsview, on the day of their 18th Anniversary. We are proud of these videos, but they would have been nothing without these exciting events and the many gracious and happy people who let us take their picture to share with the Bingo universe. ENJOY! July 3, 2017 — CANADIAN BINGO HISTORY HAS OFFICIALLY BEEN MADE AT ULTIMATE BINGO! We have just arrived back to the office, after taking pictures and video at what can only been called THE BEST BINGO EVENT IN CANADIAN HISTORY! Not only was the $250,001 in prizes a record-setter — they entire Staff worked to their highest standards and served 400 PLAYERS (sold out), guests and dignitaries (including some of Toronto’s finest) throughout the extravaganza. Doors opened at 9am, as Staff and Management arrived to get prepared. The main team had also already done a run-through days earlier, to make sure everything ran smoothly. Players began arriving around 9:30, some from as far away as Timmins, North Bay, Kitchener, and throughout the Greater Toronto Area (GTA). Not knowing exactly what to expect, beyond the huge money to be won, Players were treated to a complimentary and delicious lunch buffet (delivered and catered by the talented and beautiful team at Pastaggio Italian Eatery – Stouffville). At 1pm, the big event was under way. Some prizes went to single Winners, some went to more than 50 Players (even still, Winners pocketed almost $100 each). Some Players even won different prizes. Some of the bigger prizes were won by a single Winner, including the final Jackpot of $100,001.00!!! What was most amazing about the day where the Players themselves. Happy and courteous to each other, they enjoyed everything — including the special celebratory T-Shirt, beautiful silver coin and red tote bag. Players signed a giant poster of the program and the Winner was even interviewed by the Toronto Sun (some of you may have even heard radio updates in the GTA on July 4th). A quick single-out to Hiro, The Monster, who made a special appearance. Exciting and humourous, she brought great joy to everyone, posing and posturing while taking pictures with regular and visiting Players. Of course, we’ll have more details and pictures soon (maybe even some short video), but until then, we just wanted to thank Ultimate Bingo’s Management, including owner CARLOS CORVESE, Management, including the brothers Corvese — P.J., MICHAEL & CHRIS — and ALEX, their amazing Callers, the Front Staff, the Floor Staff (Runners) and the Snack Bar Team for giving all of us a very great time. Great work, too, by the Sponsors, including the Assocation President, who worked hard, too. Congratulations on your place in Canadian Gaming History. BINGO! You can also check out this news story, from the Toronto Sun, regarding Melanie Morel’s big win. July 1, 2017 — JULY IS ABOUT CANADA AND OUR HISTORY! NOT TO MENTION CANADIAN BINGO HISTORY WILL BE MADE ON JULY 3rd! The BIGGEST MONSTER BINGO IN CANADIAN HISTORY IS PLAYING AT ULTIMATE BINGO ON MONDAY, JULY 3rd … and we will be there, taking pictures and participating in this amazing event. With a $100,001 Final Jackpot Game, someone (or maybe someones) going to be very, very happy. Of course, there will be plenty of Canada Day events also going on at your favourite, local Bingo or Gaming Centre. Food, fun, prizes, karaoke, and so much more to enjoy. And remember, there are not many places where you can go and celebrate — and maybe walk away with a bundle of money. If you’re 18+, a Bingo Jackpot is for anyone. Making friends at Bingo, of any age, also goes without saying. We would like to salute all Canadians on Saturday, July 1st — including our military personnel, who may be abroad — and, of course, ALL THE WONDERFUL BINGO SPONSORS, CHARITIES AND NOT-FOR-PROFITS WHO SAY YES TO BINGO PLAYER MAGAZINE EACH AND EVERY MONTH. Your hard work and efforts, including fundraising, are so very important to our communities and to our citizens. We appreciate your support of our efforts to help promote Bingo and your many groups. Being charitable is a great Canadian virtue, and all of you are GREAT VOLUNTEERS & WORKERS!! Ultimate Bingo wants to remind you that they (and you) will be making Canadian History with their July 3rd $250,001 MONSTER BINGO. While others may try to copy it, Ultimate Bingo will likely hold this historical achievement proudly for a long time. As a single Bingo Hall, what they will accomplish is not only bold, it should send a message that their team is willing to go the distance in offering you the best Bingo prizes, and the best Bingo experience, in Ontario. When the dust settles, it will be back to ordinary — but, even their ordinary is extra-ordinary. Check out details on their $20,000 and $10,000 BONUS EVENTS! CLICK HERE FOR MORE! Mississauga’s Delta Bingo wants to remind Players of their amazing “PLAYERS PROGRESSIVE” Game. You can win up to $45,000!!! They will also continue their popular “DOLLAR DAY” Special on every Wednesday Session and offer their special Friday & Saturday 7pm event, where you can win up to $27,000. Finally, don’t miss the “DELTA MONEY TRAIN” dates, where you can win $10,000. CLICK HERE FOR MORE! Delta Bingo Downsview continues their popular “$25,000 FREE GAME“, which plays at every Saturday 7pm Session. They have made it a little bit more special by making the designated number to win 55, on any date. And, don’t miss the “DELTA MONEY TRAIN” dates, where you can win $10,000. Remember to sign yourself up for their “INNER CIRCLE” V.I.P. Club. Gather points and feel the love. CLICK HERE FOR MORE! Burlington’s Bingo Connection has a hit with their new, “RED BALL” Progressive — which has no cap and can grow to be HUGE! There is also a new “LETTER S” available on the Players Progressive. Check out some of the other Letter S chances available. . CLICK HERE FOR MORE! June 1, 2017 — JUNE IS ABOUT DAD … AND DADS LOVE TO PLAY BINGO, TOO! Many people wrongly think Bingo is a game played only by the elderly. If you’re 18+, a Bingo Jackpot is for anyone. Making friends at Bingo, of any age, almost goes without saying. We would like to salute all Fathers on Sunday, June 18 — and not just those Dads who play Bingo. We love our Dad because he’s given us so many reasons to do so. We hope you find this kind of connection with your Dads, too! Ultimate Bingo wants to remind you that tickets are already 90% SOLD for their history-making, upcoming $250,001 MONSTER BINGO. What makes this Ultimate Bingo Monster so historic? Lots of things. This Monster Bingo is the largest single Monster Bingo event, hosted by a single Bingo Hall — and the Final Jackpot is also record-breaking at $100,001.00. Seating is limited to only 400 seats, so don’t miss out! CLICK HERE FOR MORE! Mississauga’s Delta Bingo wants to remind Players of their amazing “PLAYERS PROGRESSIVE” Game. You can win up to $45,000!!! They will also continue their popular “DOLLAR DAY” Special on every Wednesday Session. CLICK HERE FOR MORE! Delta Bingo Downsview continues their popular “$25,000 FREE GAME“, which plays at every Saturday 7pm Session. They also will be offering “FREE $1,000 BONUS GAMES” on every Session for Father’s Day — Sunday, June 18. Remember to sign yourself up for their “INNER CIRCLE” V.I.P. Club. Gather points and feel the love. CLICK HERE FOR MORE! Burlington’s Bingo Connection has a hit with their new, “RED BALL” Progressive — which has no cap and can grow to be HUGE! They’ve added a new daily Session where the RBP can be played. Remember to stop by on Father’s Day, where an unannounced promotion will occur. CLICK HERE FOR MORE! May 1, 2017 — MAY IS ABOUT MOM … AND MOMS LOVE TO PLAY BINGO! For many regular Players, Bingo is not only a game of chance, it’s a game of friends. People of all ages look forward to getting together, to play their favourite Games and to just be together. Friends cheer when another friend wins. They groan when their friends get “so close”. They laugh and cry together. Wouldn’t you like to make some new friends? Of course, we would like to salute all Mothers on Sunday, May 14 — and not just those Moms who play Bingo. To most of us, Mom is someone very special. A friend. A confidante. A source of inspiration. We hope that on your Special Day (and everyday), is filled with good wishes, lots of hugs and choruses of “I love you”!! Ultimate Bingo wants to remind you that tickets are already 75% SOLD for their history-making, upcoming $250,001 MONSTER BINGO. What makes this Ultimate Bingo Monster so historic? Lots of things. This Monster Bingo is the largest single Monster Bingo event, hosted by a single Bingo Hall — and the Final Jackpot is also record-breaking at $100,001.00. Seating is limited to only 400 seats, so don’t miss out! There are different ways to buy in, including expanding the Basic package. You can also win a spot through other Regular Games, through the month. Be a part of Bingo History and act, today! CLICK HERE FOR MORE! Mississauga’s Delta Bingo is offering their famous “All Winners” Promotion in May, with Special Games on the 30th. You’ll also want to check out Mississauga’s “PLAYERS PROGRESSIVE” Game. You can now win up to $45,000!!! They will also continue their popular “DOLLAR DAY” Special on every Wednesday Session. You can also play an EXTRA “VICTORIA DAY” SESSION, at 10am. CLICK HERE FOR MORE! Delta Bingo Downsview continues their popular “$25,000 FREE GAME“, which plays at every Saturday 7pm Session. You can also sign yourself up for their new, “INNER CIRCLE” V.I.P. Club. Gather points and feel the love. CLICK HERE FOR MORE! Burlington’s Bingo Connection has a hit with their new, “RED BALL” Progressive — which has no cap and can grow to be HUGE! They’ve added a new daily Session where the RBP can be played. CLICK HERE FOR MORE! April 1, 2017 — SPRING HAS SPRUNG — AND THERE’S LOTS OF MONEY TO BE WON — WHEN YOU PLAY BINGO IN ONTARIO! Bingo is not only a lot of fun, to many charitable and not-for-profit groups, Bingo is a vital fund-raising activity. So, when you play, you’re doing good in your communities — and you just might win a bundle! Ultimate Bingo wants to remind you that tickets are already 75% SOLD for their history-making, upcoming $250,001 MONSTER BINGO. With only 400 seats available, you’ll want to act now, so you don’t miss out! There are different ways to buy in, including expanding the basic package. Plus, they also have more great Jackpots available every day. CLICK HERE FOR MORE! Mississauga’s Delta Bingo has increased the prize potential for their “PLAYERS PROGRESSIVE” Game. You can now win up to $45,000!!! They will continue their popular “DOLLAR DAY” Special on every Wednesday Session. CLICK HERE FOR MORE! Delta Bingo Downsview has increased the size of the prize for their “$25,000 FREE GAME“, which plays at every Saturday 7pm Session. It used to be $20,000 to win for free — so, that’s a 25% increase in this event’s prize! Plus, they are offering their “FAMOUS, SPRING UMBRELLA PROMOTION”, where Winners can select one of the colourful Umbrellas hanging throughout the Gaming Centre’s Hall. Prizes range from $25 to $1,000. You can also sign yourself up for their new, “INNER CIRCLE” V.I.P. Club. Gather points and feel the love. CLICK HERE FOR MORE! Burlington’s Bingo Connection has a new opportunity to win with their new, “RED BALL” Progressive — which has no cap and can grow to be HUGE! They also continue to offer $1 Books on four select weekly Sessions and enjoy electronic personal Bingo Verifier “TED” Specials. Plus, they are offering a new 6:40pm SESSION PROGRAMS. CLICK HERE FOR MORE! March 1, 2017 — YOU DON’T HAVE TO WAIT UNTIL ST. PATRICK’S DAY TO GET LUCKY! BINGO GAMING CENTRES HAVE LOTS OF LUCKY WINNERS EVERY SINGLE SESSION! Playing Bingo has always been fun. You can catch up with friends, socialize and play your favourite Games. You will be warm in the winter and cool in the summer. You can buy great snacks and food items, too. And, yes, it’s true — you can definitely win money, including BIG MONEY! 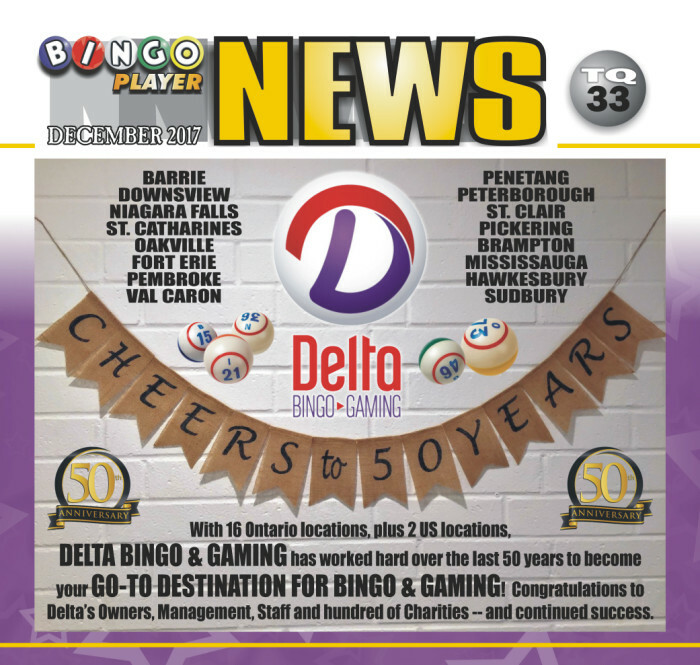 Bingo Player Magazine is also honoured to welcome back one of Ontario’s top Bingo Centres, DELTA BINGO & GAMING DOWNSVIEW. Located in North York and hosting a large and impressive list of Charitable and Not-For-Profit Sponsors. 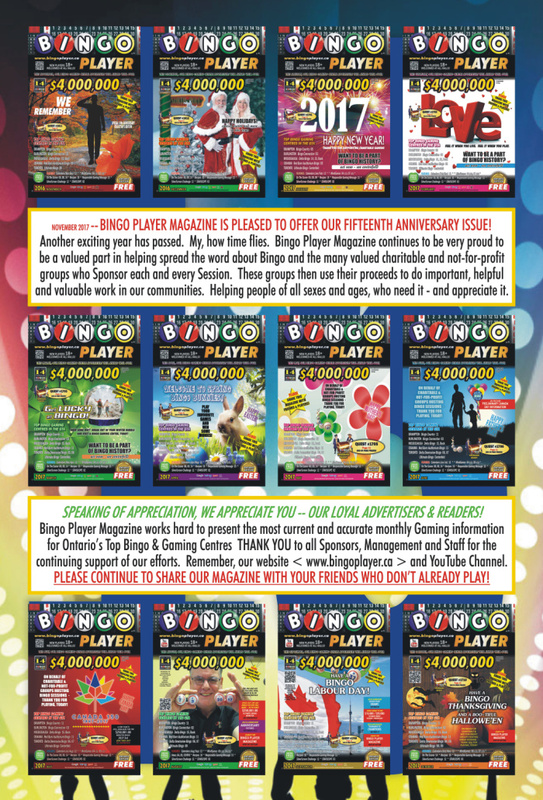 We appreciate your renewed interest in Bingo Player Magazine and will only work hard to help promote your Gaming Centre and Sponsors. Ultimate Bingo invites you to participate in BINGO HISTORY with their upcoming $250,001 MONSTER BINGO. While the big event isn’t until July 2017, ticket sales are already on — and with only 400 seats available, you’ll want to act soon, so you don’t miss out! There are different ways to buy in, including expanding your basic package. Plus, they also have more great Jackpots available every day. CLICK HERE FOR MORE! Mississauga’s Delta Bingo has increased the prize potential for their “PLAYERS PROGRESSIVE” Game. You can now win up to $45,000!!! They will continue their popular “DOLLAR DAY” Special on every Wednesday Session, plus they’ve added a new gaming activity called “CHASE THE ACE”. CLICK HERE FOR MORE! Delta Bingo Downsview offers 37 Sessions every week, so there are many chances to win. One of the most popular chances is their “$20,000 FREE GAME“, which plays at every Saturday 7pm Session. Plus, they hope you’ll sign yourself up for their new, “INNER CIRCLE” V.I.P. Club. Gather points and feel the love. CLICK HERE FOR MORE! Burlington’s Bingo Connection has a new opportunity to win, “RED BALL” Progressive has no cap and can grow to be HUGE! They also continue to offer $1 Books on four select weekly Sessions and enjoy electronic personal Bingo Verifier “TED” Specials. Plus, they are offering a new MONDAY NIGHT Program, with Bigger Line Prizes for the same price. CLICK HERE FOR MORE! February 1, 2017 — THERE’S ALWAYS SOMETHING TO LOVE ABOUT BINGO IN ONTARIO. BINGO IS, AFTER ALL, CHARITABLE GAMING AT ITS FINEST! If you haven’t played Bingo, or haven’t been to a Gaming Centre for a while, you will find the game is a lot different — and a lot better — than you might have imagined. Gaming Centres are clean and modern, with food and drinks available at all locations. The Gaming Centres are brightly lit and a fun place to meet new friends. Oh, and it’s still true that you can win BIG MONEY, too! Mississauga’s Delta Bingo celebrates Winners this February, with two additional ways to win. You can win your way in to their famous, invitation-only “TOURNAMENT OF CHAMPIONS” Event (with a $34,000 Final Program) — or you can participate in their “ALL WINNERS” Promotion, if you get lucky. They will also continue their popular “DOLLAR DAY” Special on every Wednesday Session, plus they’ve added a new gaming activity called “CHASE THE ACE”. CLICK HERE FOR MORE! Burlington’s Bingo Connection offers ways to save with $1 Books on four select weekly Sessions and enjoy electronic personal Bingo Verifier “TED” Specials. Plus, they are offering a new MONDAY NIGHT Program, with Bigger Line Prizes for the same price. CLICK HERE FOR MORE! January 1, 2017 — NO MATTER HOW YOU CELEBRATE THE HOLIDAYS, REMEMBER THAT CHARITY IS A REAL ASPECT OF ALL FULFILLED DREAMS! Bingo is, and always has been, an important part of raising funds for charitable and not-for-profit groups in Ontario. If you already play Bingo, you know what charity means, because you support it every time you play. You may choose to play when a certain group is hosting a certain Session, or you might be happy knowing some group is supported when you’re at a Hall or Gaming Centre — or you might not care who benefits at all. Be assured, every charitable or not-for-profit group who benefits when you play Bingo is appreciative. It means they can continue to help those who may need it most. Ultimate Bingo invites you to participate in BINGO HISTORY with their upcoming $250,001 MONSTER BINGO. While the big event isn’t until July 2017, they have opened up ticket sales now — and with only 400 seats available, you’ll want to act soon, so you don’t miss out! They also have more great Jackpots available every day. CLICK HERE FOR MORE! Mississauga’s Delta Bingo continues their popular “DOLLAR DAY” Special on every Wednesday Session, plus they’ve added a new gaming activity called “CHASE THE ACE”. CLICK HERE FOR MORE! Burlington’s Bingo Connection offers ways to save with $1 Books on four select weekly Sessions and enjoy electronic personal Bingo Verifier “TED” Specials. CLICK HERE FOR MORE!